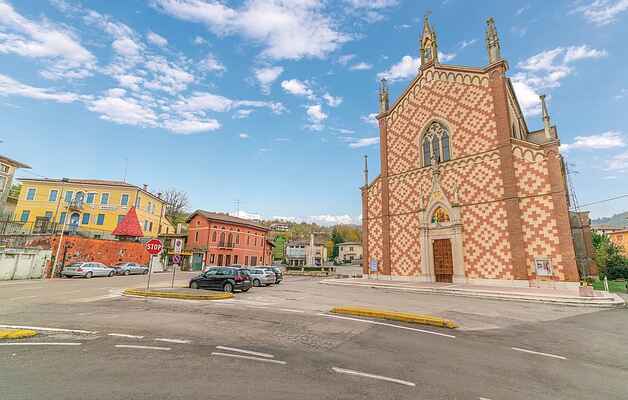 If you are looking for a spectacular location for your holidays in Veneto, this terraced house in Castelgomberto, in the province of Vicenza, is the right place for you! The accommodation with a shared swimming pool (open 10.00 am - 12.00 am and 2.00 pm - 7.00 pm) is set in the marvelous context of a late 1600s Venetian Villa, located 5 km from a golf course and close to a network of cycle paths and hiking trails, ideal for wonderful excursions on the "Little Dolomites", which offer excursions suitable for everyone: from walks for the whole family, to trekking for the more experienced ones and rock walls for climbers. In the splendid park (80,000 m²) of the villa there is also a large stone basin (pay particular attention to children) fed by the water of a stream. The accommodation is on three floors and the separation of the sleeping area on two different floors also allows two families to stay in the house sharing the living area, but having distinct bathrooms and bedrooms. In the garden there is an area reserved for guests, and under the porch there is a table around which you spend pleasant evenings, enjoying the peace of this place, while your children play in the garden. The strategic location of the Villa in the center of the region Veneto offers a wide range of historical, artistic and naturalistic itineraries. An interesting itinerary is the enogastronomic one with a visit to the wine cellars of the area where excellent wines are produced. For mountain trekking enthusiasts, in 25 km you can reach the Asiago Plateau with unspoiled natural landscapes and fantastic cross-country skiing trails in winter. The main cities of art are quickly reachable: Vicenza with its Palladian architecture (17 km); Padua with the famous Scrovegni Chapel with Giotto's frescoes (57 km); Verona with the beautiful Arena and Lake Garda with amusement parks (60 km); Venice, unique in the world (90 km). In the property there are also the accommodations IVC170, IVC171 and IVC268.